Reed Sorenson picked up the 10th last-place finish of his NASCAR Sprint Cup Series career in Sunday’s AAA Texas 500 at the Texas Motor Speedway when his #91 Plinker Tactical / MCM Elegante Toyota fell out with engine problems after he completed 6 of the race’s 335 laps. The finish was Sorenson’s fifth of the 2012 season, his second in a row, and his fourth in the last nine races. With just two races to go, Sorenson is now tied with defending LASTCAR Cup Series Champion Michael McDowell for the series lead. Sorenson qualified 39th for Sunday’s race at an average speed of 185.714 mph, ranking him seventh among the eleven "go-or-go-homers" who attempted to qualify. 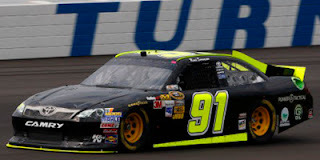 He moved to the 43rd spot soon after the green flag, taking it from last-place starter Joe Nemechek. He never relinquished it and was the first car to go behind the wall, beating J.J. Yeley by four laps. It was Yeley’s third 42nd-place finish in the last four races. The LASTCAR championship now comes down to three drivers: Sorenson, McDowell, and runner-up Josh Wise, who trails the lead duo by one finish. In the tiebreaker, which is determined by bottom-five finishes, Sorenson has the advantage over McDowell, 14-13. Wise has 14 bottom-fives as well, but needs to finish last this Sunday at Phoenix to move into contention at Homestead. All other drivers were eliminated from LASTCAR contention this week - Scott Riggs and Scott Speed would have needed to sweep both 43rds at Phoenix and Homestead, but neither are entered in this week’s race. *This was the first last-place finish for both Sorenson and the #91 in a Cup Series race at Texas.